My article is an inquiry into the political significance of Aristotle’s concept of scholê, a word usually translated as leisure. The words school andscholar are derived from scholê, which indicates a richness of meanings that cannot be captured by the word leisure.1 Perhaps taking up the subject as a political issue seems untimely during this troubled period of economic crisis. And yet, if seen from the perspective in which it was first raised, that is, as a response to the question put forth by Socrates – what type of life is worth living? – then inquiry into its nature may help us entertain the possibility that our economic and social ills may have arisen from wrong answers that we have given to the Socratic question. Before examining Aristotle’s thoughts on leisure, I will first briefly turn to Plato’s concept of scholê so as to economically bring to the fore the difficulties involved when leisure is projected unto an entire republic as an overarching aim of public life. Leisure, in its defining sense, is free time spent gazing or theorizing into the true nature of things. But it is not just time spent in such pursuit, for it embodies a moral dimension requiring a catharsis from the body’s perturbations and from all value standards that have the body’s needs as a metric. 3 Obviously the search for truth entails the activity of nous, what is often translated as mind or intelligence. But here we should recall that for Plato nous is not any type of thinking. In the Phaedo, Socrates describes it as that which is the cause of everything and that in producing order arranges everything and puts each individual thing in whatever way is best [for it].4 The mental activity occurring in scholê is thus that which apprehends the essence of anything in its best condition. A consequence of this is that nous while it is in leisure discovers itself and it comes to understand its own activity of theorizing as the highest human activity. Furthermore, it is through the activity of nous that we come to understand the essence and the purpose of scholê. Plato’s connection of leisure to the activity of nous and nous as that which formulates the nature of scholê created an indissoluble bond between the two, so that one was inconceivable without the other. Because leisure is a condition in which humans experience the best possible within themselves, one would have expected that Plato would have given considerable thought to its realization as a political end for the entire polis. Yet this he rejects. In the Laws, his final work, we learn that citizens are to enjoy ample free time, indeed there will even be laws to limit busyness, but that their scholê is to be spent primarily in festive dance and choral singing. Lest there be any misunderstanding, we should note here that Plato rejects a musical education that would seek to mould herd–like characters who would march to a common drum beat or to the use of music as a medium for the cultivation of an elitist culture of good taste.5 The music he proposes for a common education is music that aims to bring measure and order to each one of the passions within each person. Games, music, and dancing are to be crafted by philosopher–legislators as imitations of the divine order. What he calls serious play is meant to instill the pleasure and pain preferences that will allow citizens to conduct their lives according to the laws for their common welfare. Philosophy is presented as the highest form of divine imitation and the most exalted type of serious play, but it is reserved for a tiny handful of exceptional people. In short, theôria, as a republic–wide objective to be pursued in leisure is never entertained. What astounds to this day is that Aristotle boldly asserted what his teacher had come to reject – and I would venture to say something that all political theorists to this day have rejected – the notion that in leisure theoretical activity is a possibility for all citizens. Parenthetically, we see here the great divide that separates Aristotle from Thorstein Veblen, the foremost modern theoretician of leisure.11 For Veblen leisure is a sociological construct, a privileged good that is put on display by the ruling classes for the purposes of class subjugation. For Aristotle it is a natural condition in which the human yearning to seek out answers to its wonders finds its realization. Scholê is thus a sign of true freedom and is available to all citizens except when it is deformed, something which Aristotle shows occurs routinely in tyrannies. From this prism, Veblen’s theory can be viewed as a study of leisure’s perversions rather than its true nature. Aristotle’s classification of scholê as an end provides us with a way to evaluate types of free time activities so as to better ascertain the nature of leisure. Thus, we can dismiss the popular view of the lower Athenian classes who had come to believe that they were engaging in leisure when they obtained subsidies which permitted them to take an active part in the governing of their city. Ruling is not an end, it is a means to a good life. Likewise, all forms of relaxation are not to be conflated with leisure. Leisure begins only after harsh demands for existence are satisfied and these survival needs call for strenuous effort as well as anapausis, which is literally a pause so that one may start to work again. If work is a tightening of the soul, relaxation, play and entertainments are its phases of recovery, its unwinding so to speak.12 As for the pleasures of lying on a beach and sipping one’s cocktail in utter sensual delight, it would be akin to saying that one’s goal is to eat or sleep, things that can be done quite successfully by one’s pet without experiencingthe joy of what is distinctly human. Nor is learning scholê. With respect to intellectual cultivation Aristotle occasionally uses the word diagogê, a word which literally means that something is being conducted or transported by something or someone. Thus Hermes, who transports souls of the dead to the underworld across the river Styx, is called Diagogeus. Learning may be said to be a necessary, transitional phase which transports us to the opposite bank where nous will be at the ready to function. Leisure is not preparation but an end possessed, and in fact the very word scholê, according to some scholars, may be derived from the verb echein which means to have or to possess. Learning and its travails and joys are definitely the gateway to leisure and would no doubt comprise most of the activities of a leisure culture, but even so it has to be distinguished from the end, just as learning to play the violin is distinguished from performing a violin concerto. We must here stop this quest for scholê’s traits and end with the observation that no formal compilation of external traits of desirable activities would ever be a safe guide for the recognition of leisure. Music, or theoretical physics, or even philosophy if conducted for pleasure, career, or profit or cleverness, when disconnected from the controlling hand of nous as its moral purpose do not qualify as scholê. In short, scholê rests on two pillars: (1) on the moral outlook that will select it and (2) on the activity that such a moral character would select in scholê, i.e. that of theôria. And herein I believe is the crux of the difficulty. Our question is the following: Can the activity of scholê ever be practical for an entire republic? How can theôria ever be a universal goal? Is this not absurd given that few ever engage or wish to engage in it? Perhaps it is absurd if one is searching for rules and edicts which might force or persuade a populace to effect this transformation. Aristotle, I believe, provides the solution to this conundrum when he states that political friendship is the bond of the republic, and this friendship, he calls homonoia, which means together– mindness or community of mind regarding the republic’s principle for the common good, where the common good is coordinate with the actualization of the highest human faculty, that of nous.13 Homonoia, as its prefix homou or together implies, is a cooperative building of a culture in which the reigning principle of nous flourishes. To assume that every member of the political association, as an atomic unit, will possess the property of nous, to an equal degree, would be unrealistic. But here we can note in passing that neither did the Athenian democracy, in which tragedy functioned as an indispensable component of the political friendship amongst its citizens, require that all citizens be able to write tragedy in order to partake in it. Though not everyone embodies theoretical wisdom, all citizens are sufficiently cultured within their practices and habits of association to recognize and to show respect for nous’ presence. They are encouraged through the polis’ standard for reverence and honour to imitate the role models that the just persons provide and to assimilate these models into their practices. Even if all do not possess it fully, they can all recognize it and act according to its dictates. Among the problems that remain to be explained is how nous can ever be cherished socially given that only a handful ever experiences it. If left as a problem of logic, nous as end would be an empty idea without a starting point for its practical implementation. But as a matter of historical experience this is not so because in Hellenic civilization and indeed even in modern states, such as those of the United States, India, China, to name but a few, founding legislators have been the archê, the principle and starting point of each republic’s constitution. It is possible for the principle of scholê to reside in wise legislators, who, through education and persuasion, might win the populace over to nous as a way of life. One might however claim that such a prospect is unlikely because nous, as a constitutional principle, would exclude the city’s vast majority from honors and participation, or if it were diluted so as to expand participation in it, then one would create an open–ended vista for all sorts of activities that would take its place. However, we can say that the relaxation of stringent criteria for citizens to engage in leisure need not entail dilution of nous as a value. One did not reduce tragedy to a low form of popular entertainment in order to participate in it. The honors were distributed to all who furthered its flourishing, to the actors, to the chorus, to the sponsors and to the common man who could replicate tragedy’s charm in daily life. In Book 8 of the Politics Aristotle conceives of musical education as the instrumentality that will set the groundwork for participation in leisure. He agrees with his teacher who saw mousikê as a type of play for forging the moral fiber of the populace, but he went further to hold that that education in mousikê can become the experiential hub for sharing in the life of theôria. This theoretical education in mousikê presupposes a prior musical education for ethical training. Its quest, though, I believe, is knowledge of the causes of what constitutes the good music that has been selected for the city’s moral education. The student, states Aristotle, must learn to judge correctly not merely the moral characters that are represented by the music14, but also they must be able to judge what is beautiful [in the music] […] because of the study which they undertook in their youth.15 One gains through it the actual experience of what Aristotle famously calls noêsis noêsôs noêsis – where nous comes to actively comprehend the causes of the understanding it has acquired as knowledge.16 To know is to arrive at the truth and the first causes of these truths about any subject matter. In this particular case one gains insight into the first principles of what mousikê for the common life must be. Furthermore, it seems that Aristotle understood that mind, even in children, can function to grasp at a theoretical level the cause of music’s beauty with astonishing precision. Unlike all other forms of intellectual learning, which he and Plato correctly thought to be inappropriate for childhood education, music avails itself, even at this early stage, for an introduction into a theoretical understanding of causes. By cumulatively gazing on music in this way, over time the youth come to experience the first principles of human nature and its potential, and thus as they become capable as adults of defending nous, the culmination of this potential, as an institution in public life. As a consequence citizens will not easily surrender their decision–making regarding matters of great consequence to luck or to their passions or to their blind desires or to any demagogue who might manipulate these. I believe we would all agree that the great strides in productivity and technological innovation that have occurred in the last few decades have produced not freer citizens but overstressed and fearful workers. Scholê, as a way of life, it seems, is not to be determined by economics or technological progress, but from cultural and moral choices.17 And this view, though clarified by Aristotle, did not originate in philosophy. It had deep roots in Hellenic culture. Let us recall the myth of Sisyphus and how this man whom Homer calls kerdistos18 – the superlative for the person who uses mind as instrument for personal gain and self–interest – how this Sisyphus was deprived of all leisure and was condemned to overcome challenges that were devoid of any moral dimension, of any nous and any telos. In the face of our predicament which mirrors the ancient myth, I believe that not only Aristotle but the voices of all our cultures beckon us to find ways to make nous a possible way of life. Presently, it is indeed difficult to imagine how the ideal of scholê can stand up to the Sisyphean forces which are now in command of human ingenuity and the human passions. But this should not dismay us, for it is easy for us to imagine the alternatives. Given our present course, it is possible that we, with our powerful technologies and ever powerful states, may yet fall victim to Aristotle’s warning that republics unable to live a life of scholê are destined to collapse from their busyness and their misdirected pastimes. 1 The word leisure is thought to be derived from the Latin licere which meant to be permitted, to be allowed. The word leisure carries nuances which are quite alien to the concept of scholê. The nuance of being permitted to do as one pleases, in one’s free time, is especially problematical. Scholê is not derived from anyauthority other than the free persons who engage in it, nor is it appropriated individually without purpose and without reference to a moral dimension (as is suggested by the cognate word licence). 3 See Plato, Phaedo, 65d4–65e2 and 66b1–67b2. The ethical dimension of scholê is especially emphasized and developed in Plato, Theaetus 172c–176a. 5 In Plato’s Laws, 666e1–2, the Athenian tells his Spartan interlocutor: You have never attained to the best music. Your republic is like a military garrison. 8 Aristotle, Nicomachean Ethics, 1177a12–13: Εἰ δ’ ἐστὶν ἡ εὐδαιμονία κατ’ ἀρετὴν ἐνέργεια, εὔλο-γον κατὰ τὴν κρατίστην. 10 See Aristotle, Metaphysics, 982b12–13: διὰ γὰρ τὸ θαυμάζειν οἱ ἄνθρωποι καὶ νῦν καὶ τὸ πρῶτον ἤρξαντο φιλοσοφεῖν. 11 See T. Veblen, The Theory of the Leisure Class , [reprint.] Dover Publications, New York 1994. Veblen reasons to show that leisure’s utility has always, from its primordial origins, been class subjugation:wealth or power must be put into evidence, for esteem is awarded only on evidence and hence the display of leisure has always served as an archaic […] distinction between the base and the honourable (p. 24). 12 See Aristotle, Politics, 1337b40–1338a1: […] it follows that in introducing [types of play] we must watch for their timely uses, for we are introducing them as restorative medicines. For relaxation [unwinding] is a motion of the soul and it serves as a restorative [ἀνάπαυσις] because of the pleasures it confers. 13 See Aristotle, Nicomachean Ethics, 1155a22–25: ἔοικε δὲ καὶ τὰς πόλεις συνέχειν ἡ φιλία, καὶ οἱ νομοθέται μᾶλλον περὶ αὐτὴν σπουδάζειν ἢ τὴν δικαιοσύνην· ἡ γὰρ ὁμόνοια ὅμοιόν τι τῇ φιλίᾳ ἔοικεν εἶναι […]. 14 See Aristotle, Politics, 1340a16–18: δεῖ δηλονότι μανθάνειν καὶ συνεθίζεσθαι μηθὲν οὕτως ὡς τὸ κρίνειν ὀρθῶς καὶ τὸ χαίρειν τοῖς ἐπιεικέσιν ἤθεσι καὶ ταῖς καλαῖς πράξεσιν· (it is evident that it is necessary [for the young] to learn and to become habituated to nothing else as much as to judge correctly and to experience delight in noble traits of character and good actions). 15 Aristotle, Politics, 1340b35–39: ἐπεὶ τοῦ κρίνειν χάριν μετέχειν δεῖ τῶν ἔργων, διὰ τοῦτο χρὴ νέους μὲν ὄντας χρῆσθαι τοῖς ἔργοις, πρεσβυτέρους δὲ γενομένους τῶν μὲν ἔργων ἀφεῖσθαι, δύνασθαι δὲ τὰ καλὰ κρίνειν καὶ χαίρειν ὀρθῶς διὰ τὴν μάθησιν τὴν γενομένην ἐν τῇ νεότητι· ([…] it is therefore necessary when they are young to practice music but when they become older to be released from performing; in this way they will be able to judge well and enjoy music correctly because of the musical education they acquired during their youth). 17 John Maynard Keynes in Economic Possibilities for our Grandchildren written in 1930 famously predicted that in 100 years: the economic problem may be solved, or be at least within sight of solution and thus for the first time since his creation man will be faced with his real, his permanent problem – how to use his freedom […] how to occupy leisure, which science and compound interest will have won for him […]. Though the gains in productivity and the technological advances have far outstripped anything envisioned by Keynes, his prediction, which was based on the criterion of economic progress, seems now to be sorely off the mark. 18 Homer, Iliad, 6, 153: ἔνθα δὲ Σίσυφος ἔσκεν, ὃ κέρδιστος γένετ’ ἀνδρῶν (trans. Fagles: where Sisyphus used to live, the wiliest man alive). 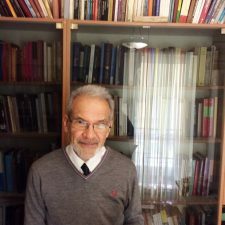 Kostas Kalimtzis is a lecturer in Ancient Greek Philosophy at Arcadia University, Greece, and an Honorary Research Associate at Royal Holloway, UK.